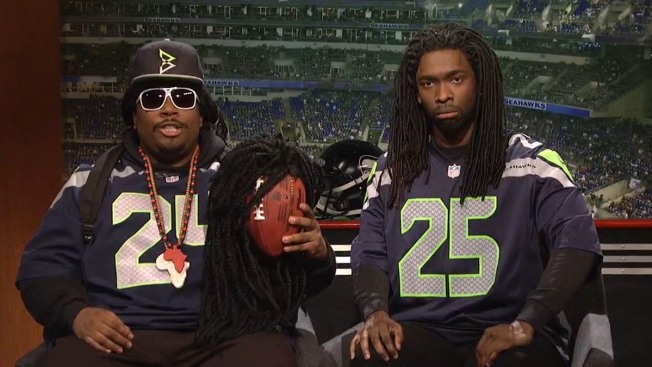 A week after lampooning the New England Patriots over DeflateGate, "Saturday Night Live" poked fun at Seahawks stars Richard Sherman and Marshawn Lynch — and their fans. In "Super Bowl Shut Down," Sherman (Jay Pharoah) and Lynch (Kenan Thompson) trash-talked DeflateGate, the New England Patriots and New York City mayor Bill de Blasio's handling of "snowmageddon." "Hey de Blasio!" Sherman said. "You seriously tryin' to shut down the whole city 'cause of that?! You better learn: The only way to shut down a city is you put Richard Sherman on it!" Lynch, as usual, was a man of few words. "I like Skittles. Shout out to Skittles," the running back mumbled. "Also, big ups to hats and glasses." The 12th Man Band was equally muted. "I've been a fan since the beginning — of 2013," the band's lead singer (Sasheer Zamata) said. Host J.K. Simmons evoked his (Golden Globe-winning) "Whiplash" role as an ultra-demanding drum teacher in his opening monologue. "Maybe you could play at my tempo if you spent as much time practicing as you do smoking pot," Simmons growled at an inept Pete Davidson. "Well, I'm not gonna practice 100 hours a week," Davidson deadpanned. The only percussionist good enough for Simmons? "SNL" alumnus (and professional musician) Fred Armisen. During "The Charade," D'Angelo's backing band The Vanguard wore shirts bearing the phrases "Black Lives Matter" and "I Can't Breathe," referencing the deaths of unarmed black men Michael Brown and Eric Garner at the hands of police. "Weekend Update" co-host Michael Che emphasized the need for a wider range of commemorative Black History Month stamps. "There's a stamp for Crispus Attucks, the first American to die in the Revolutionary War," Che said. "But what about a stamp for Crispus Attucks' mother, the first black woman to name her son Crispus?" Another bit of revisionist history: "The Jay-Z Story," a biopic of the iconic (African-American) rapper featuring (white) "SNL" writer Mike O'Brien in the title role. Kanye West (Jason Sudeikis) and Nas (J. K. Simmons) also show up. A satirical spot for the new Totino's Activity Pack for Women made fun of ads that relegate women to the kitchen. "It's full of fun little puzzles and games to keep my mind active and learning while I wait back here [in the kitchen]," a bored wife (Vanessa Bayer) says. "Anything for my hungry guys!" Two familiar faces returned to the "Weekend Update" desk. The One-Dimensional Female Character From a Male-Driven Comedy (Cecily Strong) chatted with co-host Colin Jost about predictions for the Super Bowl (even if she ended up talking about her pregnancy). Meanwhile, bitter 18th-century newspaper critic Jebidiah Atkinson (Taran Killam) arrives to lambaste the latest Grammy nomination slate. "SNL" returns Feb. 15 with a special 40th anniversary episode.